Mobile device management software first emerged in the early 2000s as mobile devices started to become more common in the workplace. However, when 2007 saw the launch of the revolutionary iPhone, it fueled a huge trend of ‘bring your own device’ to work. Finally, a device that could comfortably handle work functions and personal. Therefore, it set off a real transformation in the way that business was handled in and out of the workplace. It’s all in the name, really. That is to say, mobile device management is the software used by a business to monitor, manage, and secure mobile devices that are being used within the business. This is not to be confused with mobile application management, which is related but definitely not the same. Mobile device management is ideal for any smartphones, tablets, laptops or other endpoints. From Androids to iPhones to Chrome Books for example. 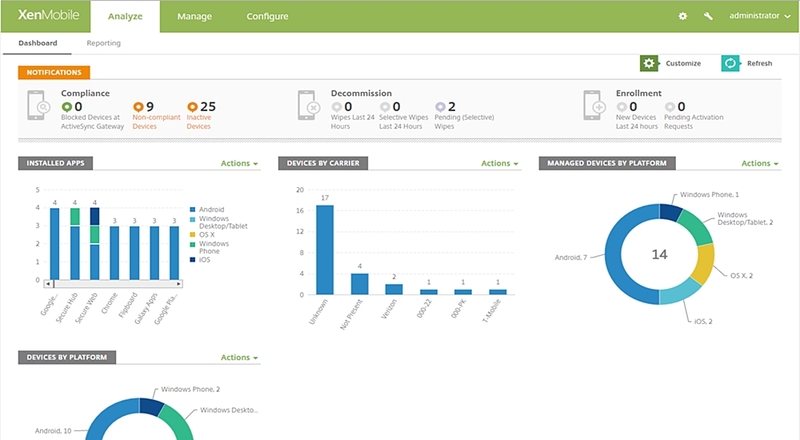 The devices are enrolled into the mobile device management software, and the administrator can configure and manage all devices from one central console. 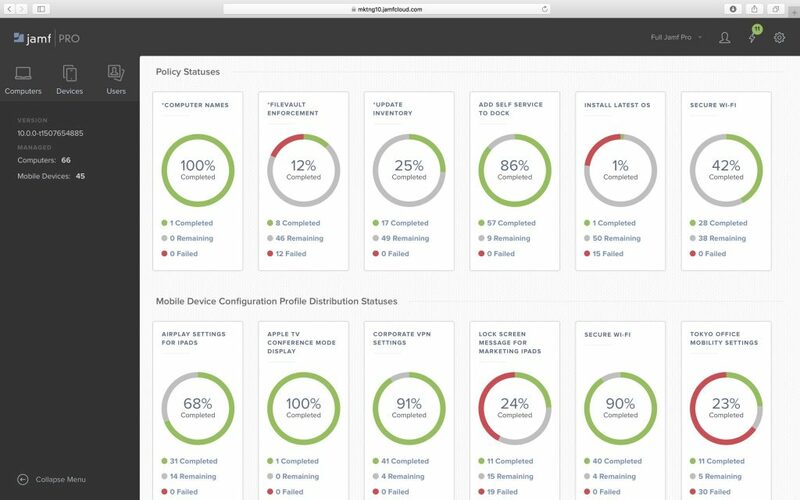 Security Policies: Create your own security policies that can be enforced across all devices from one central location. Cloud-Based: Cloud-based means you can manage all devices remotely, especially for employees out of office. Remotely Wipe Devices: If a device is stolen, remotely wipe the data to prevent unauthorised access. Remotely Disable Devices: Remotely disable devices to protect data for recovery. Logging and Reporting: Keep track of all logs and reports for compliance purposes. Alerts: Set up alerts for users attempting to bypass restrictions, or if the device is being used in an unauthorised manner. Scale-able: Add, remove and customise accounts to accommodate new users and devices. 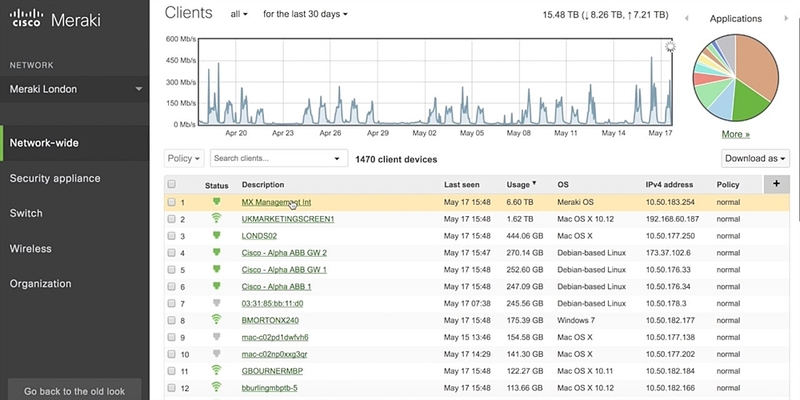 Monitor Usage: Keep an eye on app usage, file access and data usage across all users. Deploy Apps: Easily deploy business apps to all devices. Deploy Updates: Roll out device and OS updates to all users remotely. Patch all security vulnerabilities. Hardware and App Inventory: Review hardware capabilities and applications installed across devices to monitor for malware. Access Control: Specify rules about which users can perform operations and access certain data. VPN Configuration: Configure VPN settings on user devices for additional security. OS Configuration: Configure OS settings for all devices according to required permissions. So, with the growing trend of BYOD (bring your own device), there also came the need to manage and secure these devices in order to protect company data. Out of this need, mobile device management tools grew. 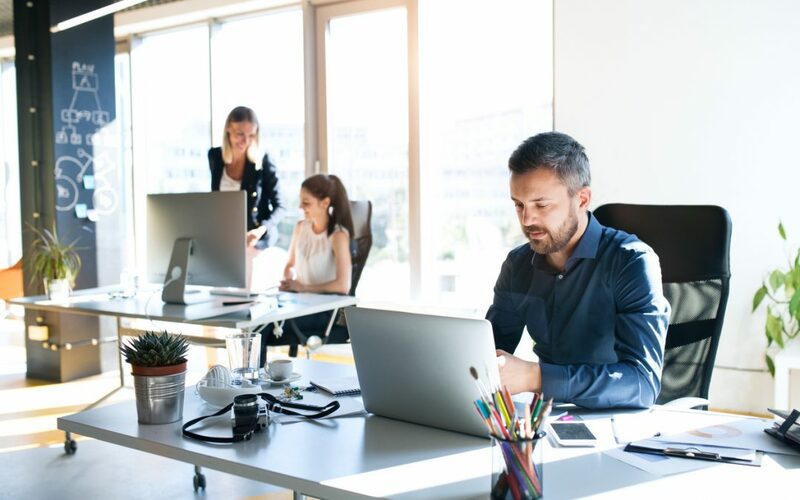 The importance of a specific mobile device management tool arose when it became clear that managing all remote devices required within the business would take quite the toll on the IT department. To sum up, previous methods required IT to manually handle each and every device, to implement security settings and ensure that all devices were protected. As you can imagine, this process was extremely tedious and time-consuming. Consequently, a centralised, cloud-based management tool completely erased the need for this manual work. We mentioned cyber security of course, but to get more specific, mobile device management tools allow businesses to remotely secure devices instantly, and roll out security updates as soon as possible, rather than taking hours or days to do so. Most importantly, this provides greater protection to company data — reducing the risk of any malware or phishing attacks. Secondly, mobile device management was able to remove the obstacle of working remotely and travelling for work. Devices can be made secure and access company data regardless of where they are working from. Unfortunately, staff terminations are rarely amicable. This often led to a risk of an ex-employee keeping mobile devices which often contained confidential company information like financial data or client lists. Mobile device management tools mean that even in such an instance, the device can be wiped remotely. IT departments lost precious time working on these devices. This takes away their time working on bigger or more important company projects. Mobile device management reduces the burden on the IT department and therefore lowers overall IT costs. Mobile devices were obviously being used in business before mobile device management software took off. People travelling for business regularly used laptops or phones. However, there was no easy or convenient way to monitor these mobile environments. 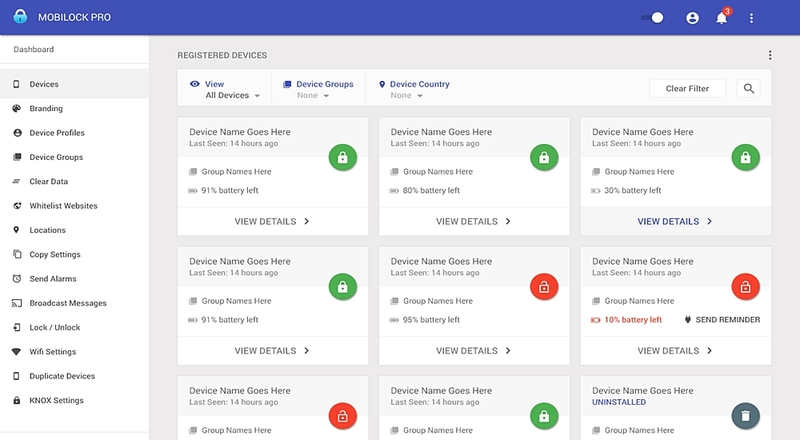 Mobile device management software allows you to check on device status, log-in attempts and password compliance. Platform Compatibility: Will you be using a uniform platform across all devices (for example, iOS) or will you have a variety of devices? What’s the scale of your business? Do you have multiple sites and a great number of mobile devices to manage? Or are you a smaller business with no separate IT department? Trial period: What sort of trial period does the software include? Would you like to test out the software and see if it works for you before committing? App Management: Do you require specific business apps or third-party apps? Check if the MDM software includes app management as well. Device Monitoring: What level of monitoring and control are you looking for? MDM capabilities vary from simple location tracking to full geofencing features. Software Support: Review what sort of support the provider offers until you’re comfortable enough to proceed without it. You may just want to purchase something and be on your way, or you may prefer a a brand that will take you by the hand until you’re ready. Cost: Evaluate the cost of the products, and determine what fits within your budget requirements. Cyber Security: Furthermore, make sure to identify what cyber security assurances are included with the software. $7.65 per user, per month for just Intune. 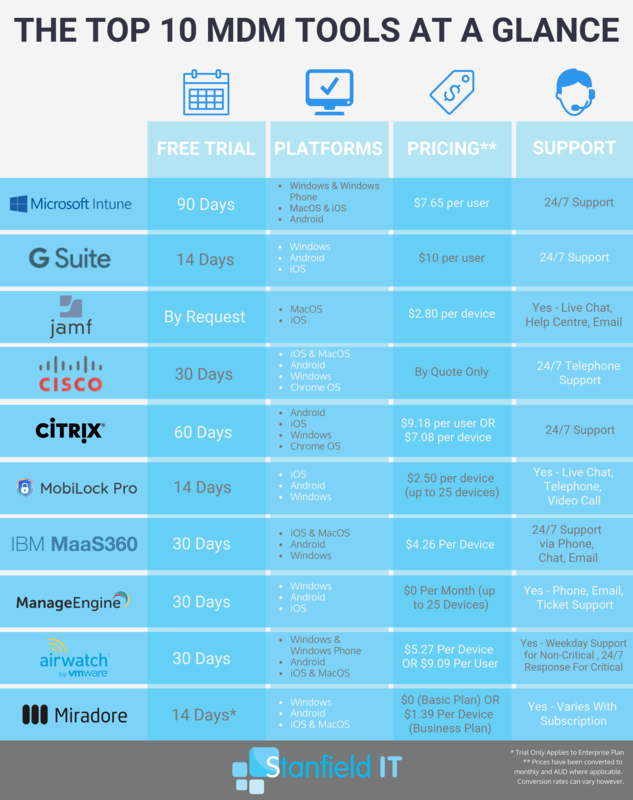 If you wish to purchase the full Enterprise Mobility + Security suite, this starts at $11.10 per user, per month. If you have G Suite within your business, then the good news is that it comes with a mobile management tool included at no extra cost. But take note that it may not have the full functionality of a standalone tool. G Suite subscriptions cost $10 per user, per month for the Business edition, which covers all essential business needs and includes MDM. $2 USD per device, per month for the basic edition. Alternately, this MDM solution from has the benefit of being part of the Cisco network of products, meaning it’s got an excellent reputation and a big, resourceful range of support behind it. Pricing is on a quote-basis, so you’ll have to contact Cisco directly. Compatible with iOS, Android, Macs and PCs. 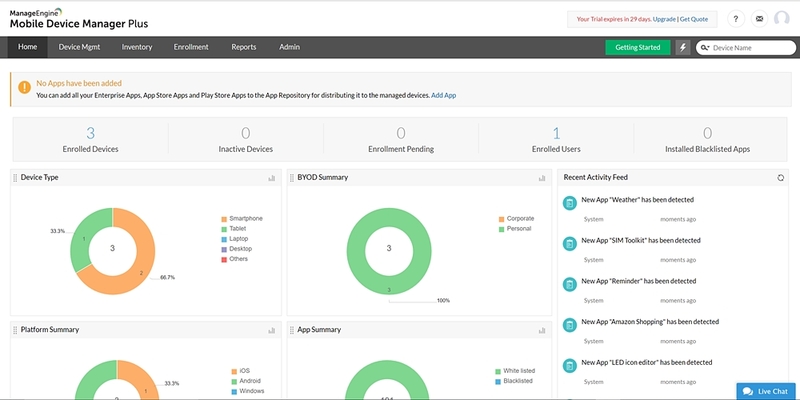 Citrix Endpoint Management (formerly known as XenMobile) is the mobile device management tool designed to manage all your endpoints through a complete enterprise mobility management solution. In addition, it has also partnered with Microsoft EMS Suite, something to consider. Pricing begins at $110.10 per user, per year (which comes to just over $9 per month). 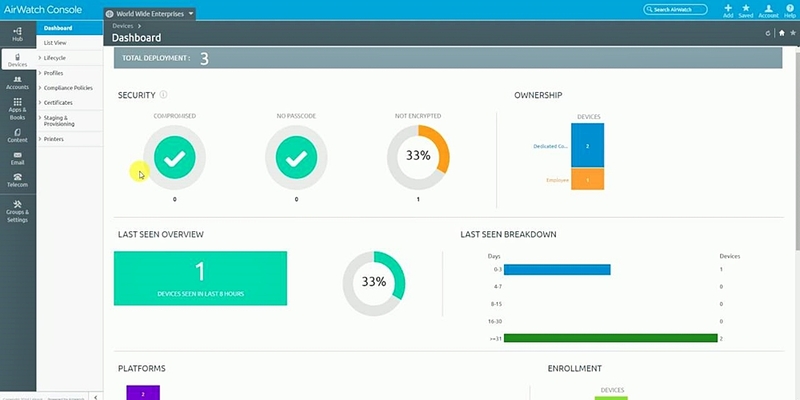 Further manage full device inventory including corporate-owned and BYOD. Create access restrictions to company data. MobiLock Pro is a great solution for companies who want to put their company-owned devices on full lockdown and have complete control. For instance, MobiLock Pro enables you to put devices in kiosk mode for restrictive access. Now supports iOS and Windows as well as Android. Create access permissions and roles. 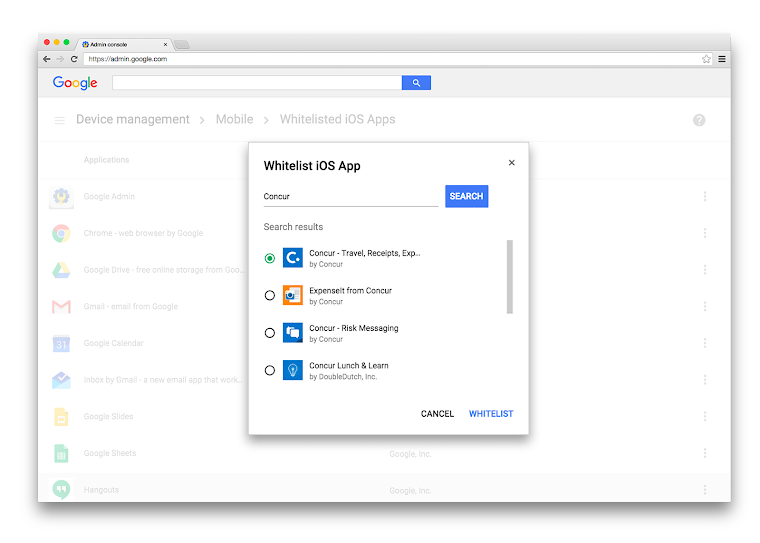 Site and App Whitelisting and Blacklisting. 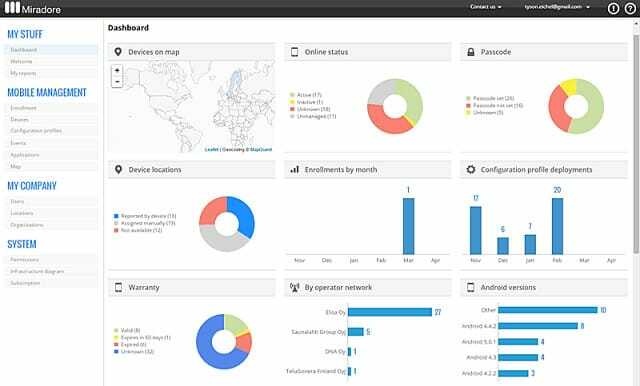 A central device management dashboard. MaaS360 with Watson is IBM’s mobile device management solution for businesses. 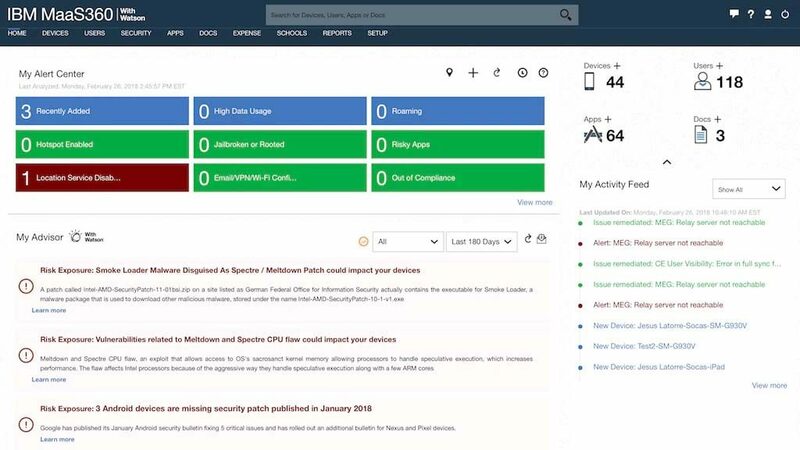 It’s an AI-driven unified endpoint management tool. But take note that some reviewers advise this is not ideal for large businesses. Pricing starts at $4.26 per device, per month for the basic plan. ManageEngine Mobile Device Management is a complete and comprehensive solution for controlling and managing devices. Above all, it’s popular for its ease of use and intuitiveness. Compatible with iOS, Windows, Android, Mac OS and more. Troubleshoot devices in real time, and remotely. AirWatch is trusted by some of the largest companies around the world, as they help businesses focus on using mobile technology without the headache of managing it. It’s a product of VMware, and as a result, you can trust the level of quality. Supports geofencing policies. That is to say, restrict access by location. Pricing begins at $3.78 USD per device, or $6.52 per user. Miradore Online is a cloud-based mobile device management solution that enables users to fully secure all mobile devices. While certainly popular for its price point, its functionality may be more limited compared to more expensive options. Miradore offers a free package for small businesses, upgrade from as little as $1 per device, per month. To sum up, there are many more mobile device management tools that you can choose from. This list could easily be doubled in size, but these are the most popular and commonly used tools that will fulfill your mobile device management needs. However, if you’re looking to expand your search, then you can also look at Soti MobiControl, Baramundi, Trend Micro Mobile Security, Hexnode, MobileIron, SureMDM, and more. Further evaluate your priorities and delve into your own research to get a fuller understanding and appreciation of what each tool offers. But if you have any questions on implementing a mobile device management tool within your business, then feel free to chat with our team at Stanfield IT. Above all, ensure that you take the time to identify your needs, and likewise prioritise them so you don’t get overwhelmed by all the choices facing you down! Moreover, don’t forget that you can always just roll with a trial product, before committing to anything for sure.